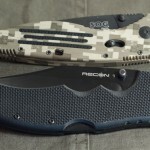 The Recon 1 is one of Cold Steel‘s newest tactical folders. First of all, this is a big folding knife and that’s not necessarily a bad thing. Blade length is four inches, but it is still relatively light considering the four inch blade since it doesn’t use steel liners in the handle. You can use it for an EDC knife (I do), but honestly, this is a knife best suited for the outdoors. The best feature of the knife is the handle. It’s made out of G-10, but the shape fits my hand perfectly, and the texture is outstanding. More on that later. This is my first Cold Steel knife and I must say I am impressed with their quality and durability. There is absolutely no play in the blade, the handle is very solid, and the lock-up is surprisingly strong and secure. I purchased the standard Clip version for my review and found the blade to be perfect for all my cutting tasks. After a couple months of regular use it is still as sharp as the day I opened the box. The pocket clip leaves just the top of the knife visible. 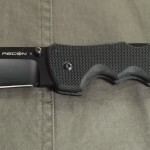 Some people may want to opt for the three inch version, but I was wanting a larger knife to carry while hiking and outdoors so the regular Recon 1 is perfect. 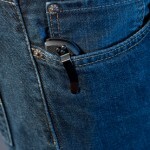 The pocket clip is strong and the knife rides fairly deep in the pocket. I personally would like less of the handle to be showing, but I was used to the SOG AegisÂ which sits extraordinarily low. Speaking of the clip, that brings me back to texture of the handle. The texture provides so much traction that I have had issues deploying the knife. It literally sticks to my pocket. To remedy the issue, I removed the clip and took a little bit of fine-grain sandpaper to the area underneath. No more problems. Another small issue I have with the Recon 1 is the finish used on the blade. Cold Steel should do something about it. The blade is chipped and scratched from normal wear while my SOG Aegis, which I’ve had for a lot longer, has almost no scratches and no chips. While this doesn’t affect functionality, it loses tacti-cool points. My first experience with Cold Steel has been good. 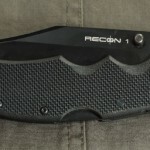 If you’re looking for a large tactical folder, the Recon 1 is a good option. The combination of a good, sharp blade and an excellent handle all for around $60 makes it a good knife. Throw it in an EDC kit or carry it with you and you won’t be disappointed. The textured handle fits the hand perfectly. 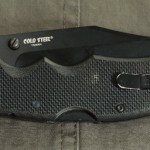 Thumb stud and textured handle of the Cold Steel Recon 1. 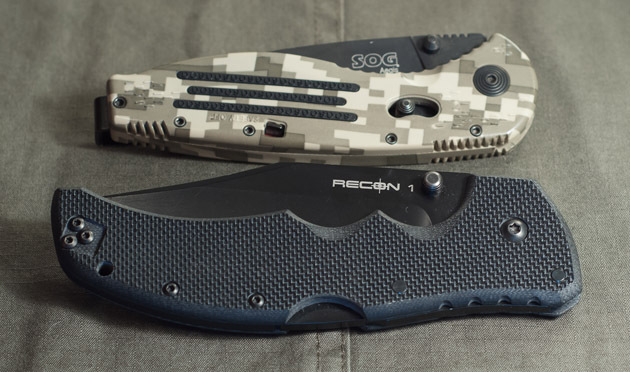 Size comparison between the Cold Steel Recon 1 and the SOG Aegis. If you see a design on Monderno, from our helmet logo to our web layout, chances are Dan is the man behind it. Dan also runs the Monderno Gear Shop, is a gun and gear nut, Christian and contributes to Monderno when his schedule allows. Excellent post! I own both GEN1 & GEN2 Cold Steel Recons in tanto. They have been excellent knives from the start. My GEN1 stays in my EDC bag while my GEN2 is my daily carry (now). 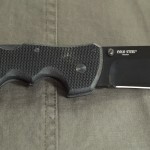 Cold Steel nailed the design on the GEN2 with a slimmer feel and high ride pocket clip. While most will carry this knife in the front pocket of their jeans, I however keep my GEN2 in my suite coat pocket while I’m at work. I never leave home without it! They both have a unique locking system while different, the two generations both lockup very tight and firm. Great for batoning, prying, or whatever the task might entail. I would high recommend them to anyone for the price! My experience with Cold steels Recon line has not been good.these knives WILL NOT stand up to hard use.I had two of these and after a few months of edc both models I owned (tanto and clip point) these knive literally started to fall apart.I guess they would be fine for opening boxes and cleaning your fingernails but that’s about it.very disapointed with CS quality as of late.